Lay bead in greased casserole dish. In a large measuring cup combine milk, butter, eggs, ½c.sugar, vanilla. Mix well. Pour this custard over the bread and let sit just 5-10 minutes. Bake at 350 for 60-70 minutes until puffed, golden and set in center. Sprinkle top with 2 T. sugar and broil just 2 minutes or less. Keep a close eye so it does not burn!!! Combine first 4 sauce ingredients in a pot. Cook over medium, stirring occasionally, 5-8 minutes or until thickens and boils. Remove from heat and stir in vanilla slowly. 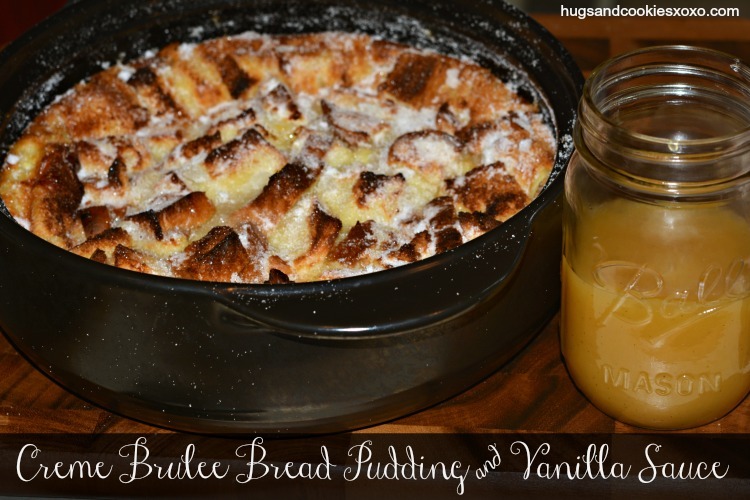 Spoon warm bread pudding onto plates and serve with vanilla bean cream.